Professor Penrose is one of the world’s leading mathematicians and a man who has also made significant contributions to theoretical physics. His work with Stephen Hawking on black holes is almost as famous as his purely mathematical contributions in the field of tiling, yet his contributions to science go well beyond these highlights. So when he writes a book subtitled An Extraordinary New View of the Universe, anyone who is interested in the world, how it works, and how it got here will consider picking it up. And he really does present a quite extraordinary hypothesis. The universe, he says, is cycling repeatedly from one big bang to another. It bursts into existence in a very special state of uniformity and extremely low entropy, expands in ways consistent with the Second Law of Thermodynamics (which means entropy is constantly increasing—mostly through the production of black holes), and this expansion accelerates to infinity, over a period of at least 10100 years, as the black holes evaporate away and even the rest mass of electrons and positrons fade to nothing. And then, by a geometrical sleight of hand, the new, uniform, low-entropy, “spacelike surface” of the end of the old universe becomes the uniform, low-entropy, “spacelike surface” of the big bang for a new universe. To get from big bang to big bang, Professor Penrose takes us on a journey that starts with the peculiar imperative of increasing entropy and the Second Law, passes through the special nature of the big bang, and ends with what he calls “conformal cyclic cosmology” (“conformal” because, he conjectures, sometime in the future, all particles are effectively massless and their “world lines” are therefore constrained to the outer surface of a “null cone” in a Minkovskian 4-space). And if you’re having trouble following this, then Cycles of Time might not be the book for you. Usually popular science books written for the layperson introduce us to established science or summarize a new field. They avoid complex mathematics as much as possible, and they take their time over the more difficult ideas, often repeating the same material in slightly different ways to help the layperson fumble their way through the arguments. Cycles of Time is not that kind of book. It describes the author’s own groundbreaking and controversial research in cosmology. It is a difficult read and tackles extremely deep and complicated matters. Repetition is almost completely avoided, replaced with references back to where the material was first introduced or discussed. Although the reader is spared the worst of the mathematics (which is, nevertheless, presented in a set of appendices) there is enough in the text to cause most laypersons work hard to follow it; and the physical concepts presented are not for the fainthearted. Yet it is worth the work. Dr. Penrose is a clear and articulate writer. Even his academic papers are a marvel of lucidity. If these ideas seem hard, it is probably because they are, and even one of the world’s best science writers cannot make them any simpler than this. 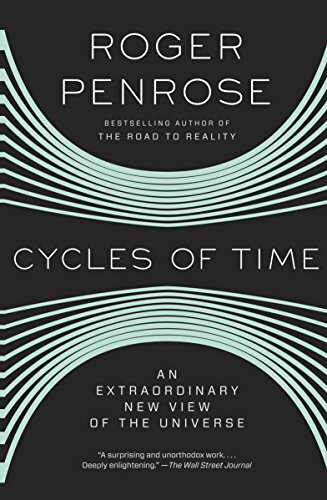 There are many references in Cycles of Time to Professor Penrose’s earlier, 1,000-page work, The Road to Reality, and it is probably fair to say that this earlier book should be kept handy as a companion work when reading Cycles of Time. And degrees in math and physics would probably help, too. Why is it worth the work? Well, there are great insights to be had here into the nature of entropy, the Second Law of Thermodynamics, and their relationship to the big bang and to black holes. Even though Dr. Penrose makes some assumptions which, even to a layperson seem suspect (for example, that the mass of the electron and positron will fade away given enough time, and that information loss in black holes can be re-stated as a loss of degrees of freedom as the singularity consumes particles) he also makes predictions, at least one of which (concentric anisotropies in the cosmic microwave background—CMB—due to gravity waves from pre-big bang black hole interactions) has been tested and found to exist in the data. Many physicists argue that these circles in the CMB are statistical artifacts or that they are the result of colliding universes in a very different kind of multiverse. Yet the fact remains that they support Dr. Penrose’s “extraordinary view.” And in the end, the data is what really matters in science. Probably the best thing to do is to take a deep breath, grab a copy of this fascinating book, and plunge right in.